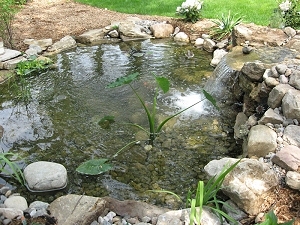 The source of life, water is beautiful to watch, relaxing to listen to, and can be home to many interesting and beautiful forms of plant and animal life. 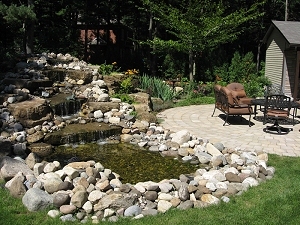 A well designed water feature often becomes the focal point of a property’s landscaping, and is a great source of pride and pleasure for the homeowner. 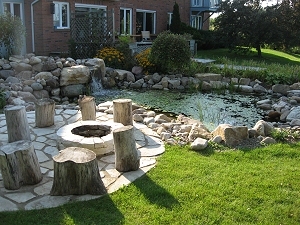 There are many options and variations available when considering the installation of a water feature. 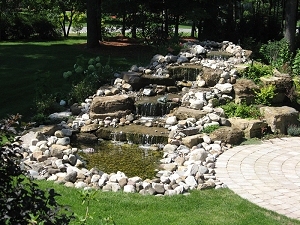 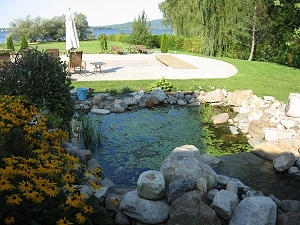 The classic and most complete water feature is a stream and or waterfall emptying into a pond. 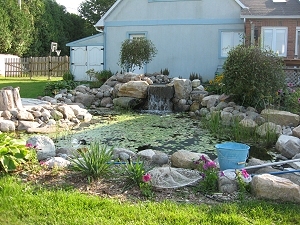 With a set-up like this, the property owner can enjoy the sound rushing water in the stream, the beauty of still water in the pond area, and enjoy playing host to beautiful aquatic plants and lively fish. 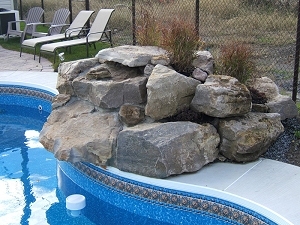 Selection of rock type also will have a large impact on the outcome, style, and individuality of the project. 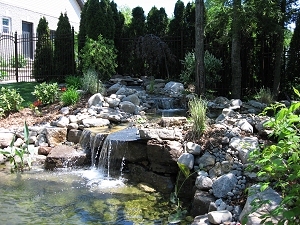 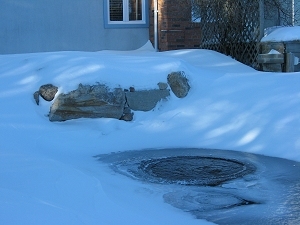 A pond and waterfall can be fully functional year round with the installation of a bubbler in the fall which will keep the pond from freezing over, and eliminate any worries about fish surviving the winter. 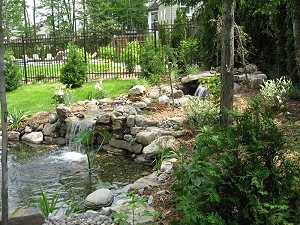 Typical pond maintenance is limited to the installation of the bubbler in the fall, draining, cleaning, and re-starting the pond in the spring, and checking the filter net regularly throughout the summer. 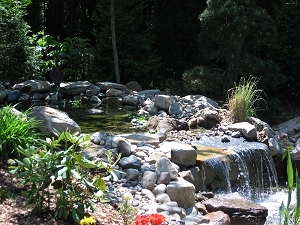 If space is a concern, a ‘pondless waterfall’ is an option to consider. 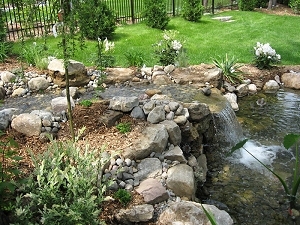 This feature includes a waterfall and a stream that empties into a drywell of rock wherein the operating pump is housed. 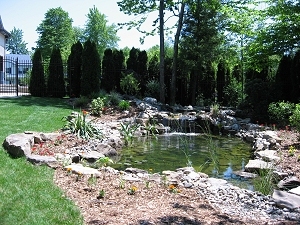 Not only is this option space efficient as it eliminates the pond, but it also eliminates the hazards associated with open water. 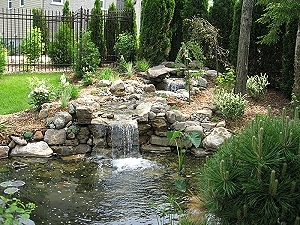 Thus, the ‘pondless waterfall’ may also be the best choice for homeowners with small children, as well as commercial applications. 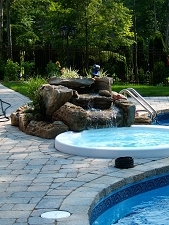 If there is already a pool, or plans for a pool, the addition of an integrated waterfall will add the beauty and sound of gushing water to the pool area. 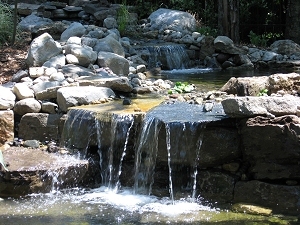 Set up to run off the pool pump, the construction of a poolside waterfall takes up relatively little room, and in most cases its installation is less time consuming than the construction of a traditional pond and waterfall feature.